Get them while they are young. 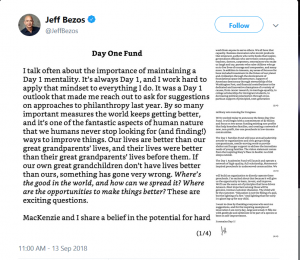 Amazon CEO Jeff Bezos on Wednesday announced a $2 billion philanthropic fund to finance a new network of preschools and contribute to nonprofits assisting homeless families. Bezos, who Forbes estimates is worth $163 billion, is the wealthiest person in modern history. The announcement comes as the Amazon founder is visiting the capital for a speech at The Economic Club of Washington on Thursday.